College is full of many things. Excitement. Opportunities. Experiences. You know, all of the good stuff! However, college is also filled with even “more important” things… food and beer! What college student does not love to grab a quick burger or fattening milkshake before heading to class or to their dorms? C’mon, let’s get real, we have all been guilty of it. With the amount of unlimited food and the amount of parties at college, students begin to stop losing track of their eating habits. With that being said, students eventually begin to gain mass amounts of weight during their first year at college, which is known as the Freshman 15. According to Walden Behavioral Care, “The freshman fifteen can be attributed to stress, lack of sleep, late nights, frequent snacking, lack of exercise and alcohol intake.” I have known way too many people who have fallen into this trap and it could lead to even more serious issues other than obesity. Some people get so concerned with the Freshman 15 or are so upset about gaining the Freshman 15 that they begin serious eating disorders. Some people are so worried about their figure and body image that they completely stop eating (anorexia) or throw up their food (bulimia) to avoid gaining weight or to lose the weight that they gained from the Freshman 15. As you can see, this has become a major problem that has been arising in colleges across the globe. Let’s take a look at this chart. 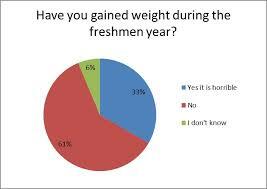 According to this study, 33% of freshman at this university said that they have gained weight during their freshman year. So, more than 1 out of every 4 people at that university has gained weight. The Freshman 15 is real and is way too common. Since the percentage is decently high, it is easier to see why so many teenagers fear and/or gain the Freshman 15. It is charts like these which could lead an innocent 18 year old male or female to stop eating. From personal experience, I have already seen signs of my own friends here at Penn State who could be in danger of falling into either the Freshman 15 trap or the eating disorder trap. Some signs that I have seen is that some of my friends tell me how they have only eaten a piece of bread or a granola bar the whole entire day. I have also seen girls throwing up at parties and later on finding out that they have not eaten a single thing that entire day, which is a big reason why someone would throw up from drinking. It is scary. 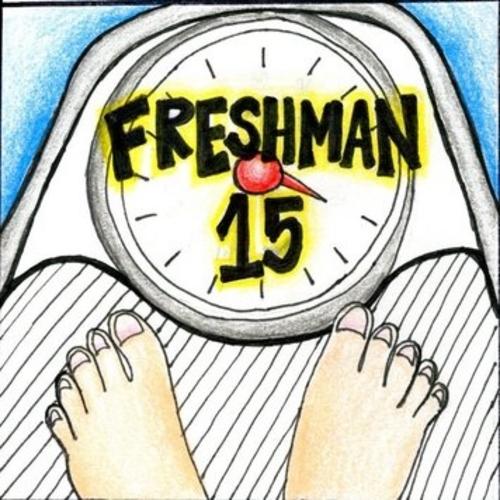 To learn how to eat healthy and fight off the Freshman 15, please go to this link to help yourself, a friend, an acquaintance, a classmate, or anyone out. We need to stop this horrible trend in college. So… What do you think should be done to eliminate the Freshman 15 and the eating disorders that can be created because of it? “Fear of the Freshman 15 Can Lead to Eating Disorders – The Recovery Village.” The Recovery Village. N.p., n.d. Web. 08 Sept. 2014. “The Freshman 15.” Walden Behavioral Care The Freshman 15 Comments. N.p., n.d. Web. 08 Sept. 2014. “No “Freshman 15″” Atlanta Center for Eating Disorders. N.p., n.d. Web. 08 Sept. 2014. This entry was posted in Uncategorized and tagged eating disorders, fat, freshman, weight on September 8, 2014 by Adam Greene. (In response to) Amanda, I see what you are saying, but do you really think that walking to a class can really burn off a fattening piece of pizza or burger? Just think about it, running a mile would burn off around 100ish calories. If you walked a mile, you would burn way less calories (around 65ish). You’re average burger and pizza slice is around 280ish calories (which could easily be more due to additional toppings). The walk from East to College Ave is only 1 mile. With that being said, walking to class will be even less than that. So walking to and from class will barely even burn off half of the calories. As you can see, you must do way more than walking to class to burn off all of the fattening calories. The calories will add up in the end. I think the freshman 15 is a real thing. Most of the food we have here is unlimited and not exactly the healthiest choice. We are used to eating at certain times to. With new schedules and eating randomly are body isn’t quite used to it. Since I’ve gotten here I have gained weight for sure but I haven’t been working out either. I had time to go to the gym at home but haven’t gotten used to my schedule yet enough to schedule a gym time for myself. That could also be a huge difference for most people going from eating whatever they want while working out, to still eating whatever and no working out. I personally think the freshman 15 is just a myth. If you think about it, every single person is different, whether it’s different body types or different eating habits. Just because we are being put into a new environment with new stresses doesn’t mean we’re going to gain more weight. Especially at a place like Penn State, it’s almost impossible for someone to gain weight with the amount of walking you have to do around such a big campus. If anything, you’ll lose weight! Yes, I’ll admit I splurge on a chocolate bar or pizza every so often, but within the next few minutes of standing up, you’re already walking to your next class, and all the calories you just consumed are being burned off. That’s why the freshman 15 doesn’t scare me! I think this is a great topic for starting off the year! And you did a great job writing this as well. Its so true that many of us can fall into either one or the other. I know so far Ive kind of been doing both. Some days I eat hardly anything at all mostly because I’m nonstop all day and I don’t realize that I haven’t eaten anything, Then other days I’m stuck in my room all day working on homework, so I distract myself with constant snacking. Neither of which is a very healthy way to start off your journey in college. I think the freshmen fifteen is part of the adjustment to college. Many kids haven’t been on their own and have never had to think much about what they eat, and now they are responsible to watch what they eat and how much of it. However, once they realize that they’ve gained fifteen pounds, they start to figure out ways to manage what they eat. I think if people are worried about the freshmen fifteen they should look into the resources around them. Look for healthier food options instead of picking up a hamburger before class. Take advantage of the salad bar in the dining halls. Keep healthier snacks to munch on when you are bored in your room. And if you have free time, take a walk, even with all the walking we do already.